Dragon finally gets to return home to his original Earth but is horrified to discover that it has been reduced to lifeless floating rocks in space. He returns through Battle Tank’s portal to report his findings and is left devastated by the revelations. His children and all of his old friends had lived in that reality and now they are all gone. 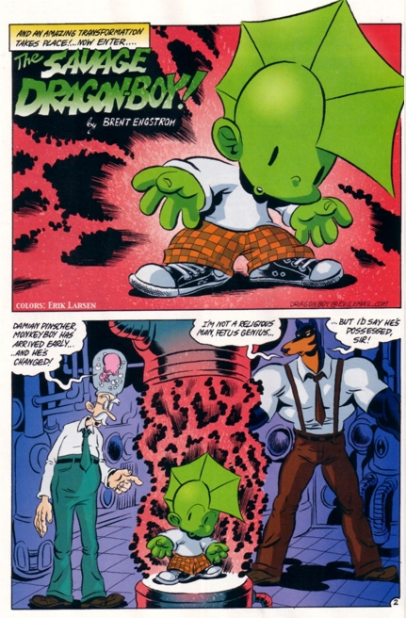 Rex Dexter suspects that the Devourer of Worlds, now dubbed Universo, was responsible as it makes sense for him to have attacked at the same time in numerous realities. The death of his Earth leaves Dragon in a deeply depressed state and Jennifer Murphy does her best to cheer him up. He had wanted to take her to his home reality and show her around but the worst part is that he may have inadvertently killed his own son and step-daughter through his actions. The fact that he removed Dark Dragon from Earth so he could not defend it may have been the cause of the planet’s death, although the lack of a functioning Liberty League is also a highly likely cause. Some time passes and the day of Dragon’s wedding finally arrives and the hero is incredibly nervous after his bride-to-be was seemingly killed during their last attempt to get married. Frank Darling assures him that the Liberty League is looking out for trouble and everything should proceed smoothly. Jennifer’s best friend Gertie Funt questions the wisdom of marrying someone she has only known for a few months. This concern is dismissed as Dragon and Jennifer have known each for years now, albeit across different realities. Alex Wilde passes on her congratulations to Dragon and the pair gets to talking about the death of their original world. Alex is still searching for Chris Robinson but has thus far had no luck but she remains hopeful that he can be located and that she can finally experience some lasting happiness. The wedding ceremony finally commences and goes off without any issues. Angel is less than pleased at the sight of her mother kissing Dragon but there is little she can do but accept the union. Dragon introduces Jennifer to a number of his friends as Angel is freaked out by the amount of super-freaks in attendance. Mako reveals that things have not been going at all well with his relationship with Dart. Rock is enjoying married life with Widow and wishes Dragon to be as happy as he is. William Jonson and Rita Medermade are considering marriage themselves and are eager to see how Dragon adapts to the change to his lifestyle. After the wedding has finished, Dragon and his new family begin to settle in to their new lives with one another. 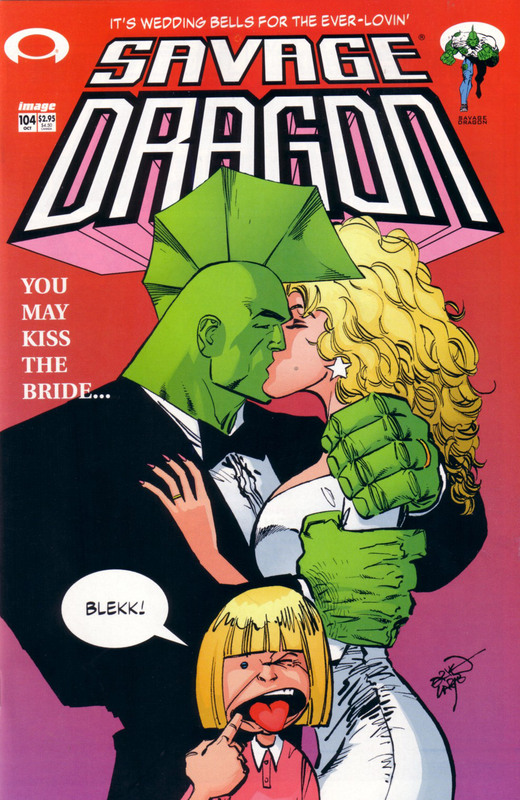 Dragon produces a costume for his wife that is identical to her counterpart in his reality so that she can join him in heroic activity. The family then head out on a honeymoon to the Grand Canyon which is incredibly dull for Dragon, so dull in fact that he welcomes the intrusion by a giant monster. An alien dictator from the Void grows frustrated by the lack of challenges in his dimension and teleports to Earth so that he may challenge Dragon. Upon arrival his teleportation device is broken by Angel and he is trapped on Earth. Ba-Goom becomes known as Mister Glum to Angel and the two soon strike up a friendship with one another. Angel is then taken to school by her parents and is embarrassed when Dragon reveals that he is her father. With Jennifer now active as a superhero, Dragon decides that it would be best if she was to join the ranks of the Liberty League. He introduces her as the latest member and Jennifer is met with some initial resistance but they soon welcome her into their ranks. The new Liberty League then fly off on their first mission together.